Voters in Lawrence, Kansas approved reallocating 1/20th of a penny of city sales tax to an affordable housing trust fund on November 7, 2017, providing the first dedicated source of revenue to the fund. 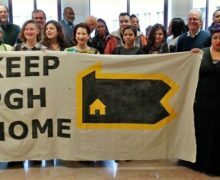 The Lawrence Affordable Housing Trust Fund (AHTF) encourages and supports the acquisition, rehabilitation, and development of affordable housing and emergency shelter, as well as supportive services necessary to maintain independent living. The approved sales tax is estimated to raise $10 Million from April 2019 through 2029. The Lawrence City Council established the AHTFund by ordinance in 2001 to provide a funding mechanism to support the City’s affordable housing strategy. The AHTFund is currently administered under the auspices of community development within the Planning and Development Services Department of the City of Lawrence. Eligible uses for the AHTFund include property acquisition, new construction for rental or sale, rehabilitation including moving structure for rental or sale, and housing-related services. 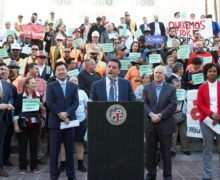 The ordinance establishes an Affordable Housing Advisory Board of no less than eight members to serve in an advisory capacity to City Council on the implementation of the AHTFund, including conducting review of applications for AHTFund resources, making recommendations on funding awards, and submitting annual reports to City Council. The ordinance did not commit funding to the AHTFund. Justice Matters, a non-profit community action organization comprised of 21 faith organizations in Lawrence and a member of the DART network, played an instrumental role in building the political will among elected officials and the public to commit ongoing public resources to the AHTFund. Despite a clear need to invest in affordable housing (City funded studies in 1993 and 2004 demonstrated a need for at least 4,000 new affordable homes and apartments), neither the City of Lawrence nor Douglas County were taking action. With the formation of Justice Matters in 2014, the conversation shifted thanks to people power. 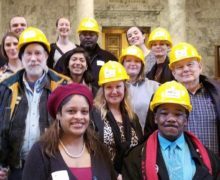 Annual Nehemiah Action Assemblies, an activated base of members, and an unwavering persistence from Justice Matters got the housing revenue measure on the 2017 ballot and helped secure the votes to win. Justice Matters members contacted more than 14,000 voters and raised more than $10,000 in donations to support the Yes campaign. The success of the pilot project, shown here in the demolition phase, paved way for increasing investment in AHTF. Justice Matters jump started the housing trust fund revenue conversation at its 2015 Nehemiah Assembly, which led to City staff allocating $100,000 to put into an affordable housing pilot project to demonstrate the impact of local funds. The successful three-building development, currently provides homes to 22 people in three families, including 17 children, and with a requirement that the properties are permanently affordable. Building on the accomplishment of the pilot project, in 2016 City Commissioners approved $300,000 for the AHTFund for FY2017-2018 budgets, and $350,000 for FY2019-2021. Beginning in April 2019, the AHTFund will receive an additional $1 million a year from the sales tax. 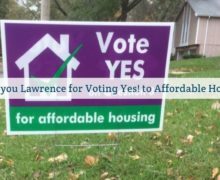 To learn more about the Lawrence Affordable Housing Trust Fund, contact Diane Stoddard, City of Lawrence, DStoddard@lawrenceks.org or (785) 832-3413.